Small-farm agroecology has been identified by the FAO and other international agencies as the direction that we must take agriculture if we are to achieve a sustainable global agri-food system. But a commitment to small-farm agroecology (SFA) has dramatic consequences for the structure of economic and political decision making. As detailed by scholars such as Miguel Altieri, SFA is a culturally embedded relation of production enmeshed within specific landscapes. Consequently SFA is not ‘transferable’ in the way that industrial agriculture systems have been propagated. This propagation has been built on the ongoing delegitimization, marginalization, and dispossession of indigenous peoples and peasantries through Euro-American colonialism and imperialism. Despite this, and despite many prognostications of the inevitable demise of SFA and of peasantry in general, SFA has in fact continued to work and in many places today we are seeing processes of repeasantization underway. Repeasantization though is not a unilinear process. Though there are many examples of resurgent peasantries generating community well being, there are also examples of a reversion to the kind of straightened circumstances that peasants have been forced into time and again over the centuries. 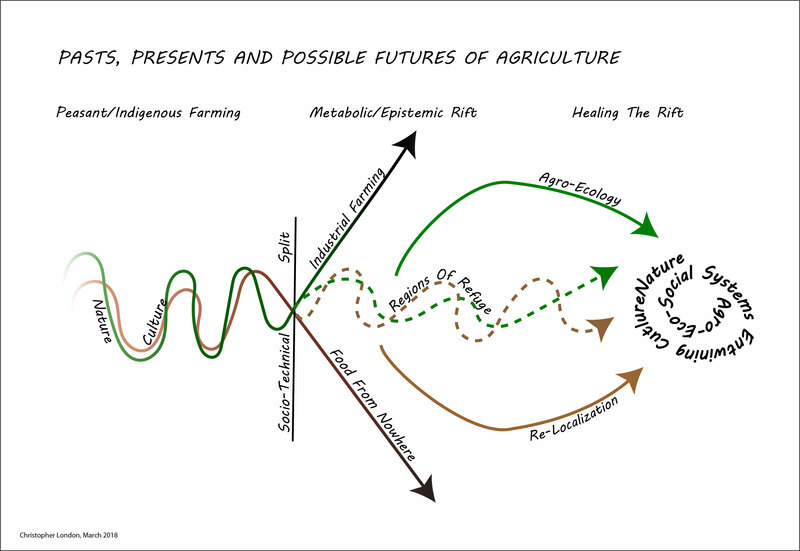 If SFA is to be not just an alternative to, but a replacement for, the industrial agricultural system how are we to situate this within the long run history of agriculture? How can the heterogeneous and idiosyncratic localism of SFA cohere into a model of social and technical organization, that is, a culture, that can overcome the totalizing power of the corporate agri-food system? To address these questions this project has three steps which are currently encapsulated in a series of diagrams that I draw and redraw when engaging with students. 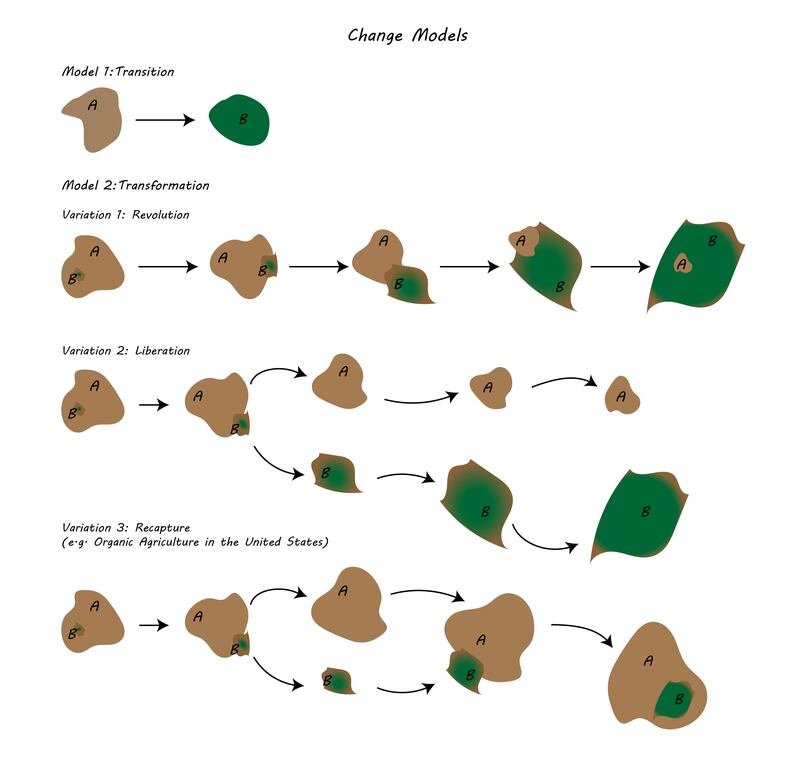 The first step is to identify a model of social change that can account for the variegated history of agriculture. I do this by proposing a transformation approach to social change over and against the conventional transitional approach. What the transformation model builds on is the dialectical claim that the conditions of the future are imminent within the present. 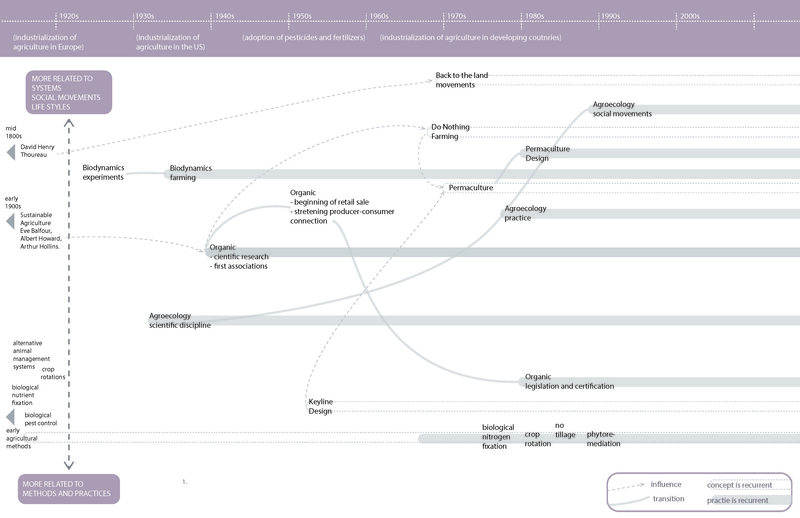 The second step is to apply the transformation model to the history of agriculture. This has two components. 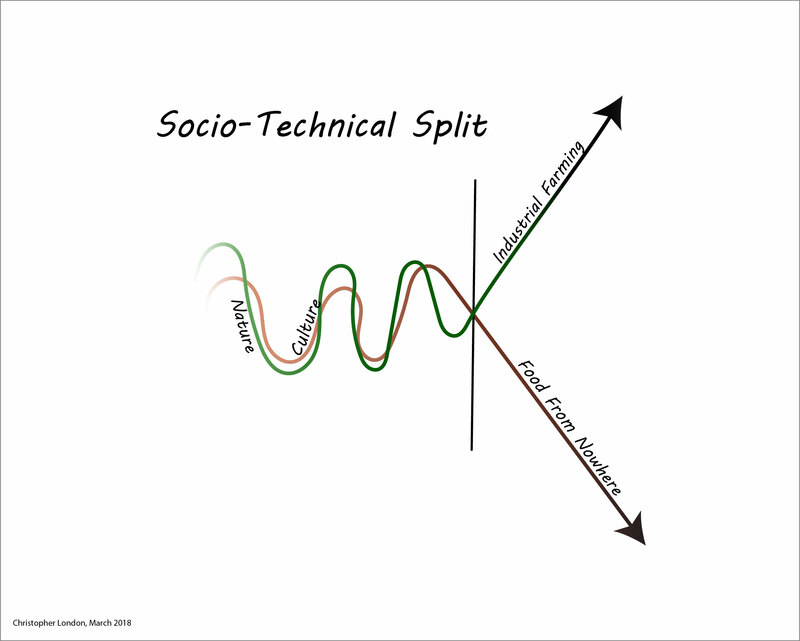 The first is to outline what I refer to as the socio-technical split of industrial agriculture when farming practices came to be seen as a something separate and distinct from the everyday beliefs and behaviors of persons. The second is examine diverse attempts to either create or sustain socially embedded agricultural systems. In the industrial West alone there have been several attempts to do this (the most successful being organic agriculture, which in the US at least due to it’s market success has been re-absorbed into the industrial agri-food system). What these efforts show is that the future is not only imminent within the present it is imminent in the past and it is reworking that very past that can yield a different future. What this discussion will lead to is the claim that the key to generalizing SFA as a replacement for industrial agriculture is not to be found in a totalizing model, in fact, by definition this would be impossible. Instead what is necessary is a planning model that upends the conventional top-down policy driven project cycle and instead center implementation processes as the key starting point for political and economic decision making. The third step of this presentation then will be to examine current attempts to do just this. At least four New School graduates that I have worked with are currently engaged in implementation driven efforts to build or engage with some form of SFA. Through a consideration of these efforts the conceptual frameworks presented will be examined in light of concrete experiences. What are the specific challenges that arise when attempting to re-enmesh the social and the technical in farming systems? What are the resistances from state and capital, but also from farmers themselves? Can these types of efforts proliferate such that they could coalesce into a form of distributed sustainability, much as happened with organic agriculture until it was captured by capital? I am working with GPIA alum Larissa Ushizima to rework her master’s thesis for publication. Deploying Tourism Continuum analytical model I developed in the ’90s we will present an argument on strategies for bringing the critical analytical frameworks of political ecology and the literature on alternative food networks (AFNs) to better assess efforts to build sustainable ecotourism. The case of Bonito is used to illustrate the limitations of ecotourism discourse and practices as well as the strength of the analytical model and AFN research.